The UNESCO Institute for Educational Planning (IIEP-UNESCO), in collaboration with the International Association of Universities (IAU), has just published Quality Management in higher education: Developments and drivers. This book fills a knowledge gap on the state of quality management in higher education institutions today. 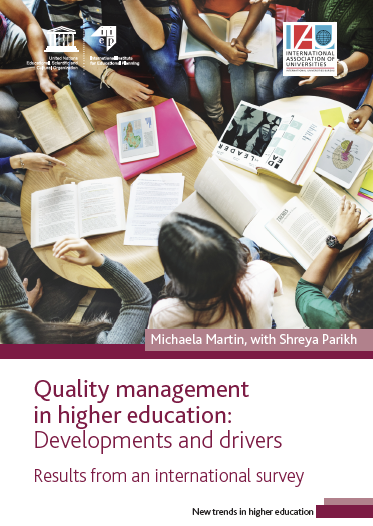 Author Michaela Martin, with Shreya Parikh, draw from the responses of over 300 institutions worldwide to map recent developments, external and internal drivers, and obstacles around the implementation of quality management policies. As the first truly global survey of its kind, it provides primary data and analysis on this salient issue in higher education reform. Decision-makers in higher education are increasingly seeking models for state-of-the art quality management systems, which can help pave the way to improved academic quality and graduate employability. This book helps explain the dynamics of quality management (QM), including its various actors, structures and tools from a global and regional level perspective. Its wealth of insight can help in the implementation of policies that can enable higher education to act as a driver for socioeconomic progress and overall sustainable development. This is especially important in the era of the Sustainable Development Goals (SDG) as higher education is part of the education related goal and more broadly, can help in the achievement of all goals. The survey found that quality management is overall an institutional priority, with its main focus or orientation most often being linked to teaching and learning. Graduate employability, while it features prominently in political discourse, was found to be less of a focus area in quality management. The analysis of the data shows that QM is also widely formalized through a quality policy, but less so through clear procedures and responsibilities for QM, as outlined in a quality manual. Leadership, such as the head of the institution or the vice rector play an important role in leading quality management, but support structures such as quality management offices or units at both central and even more so at decentralized levels are often lacking. How is data from QM used? Furthermore, the survey found that data generated from quality monitoring is often not used for decision-making in the quality improvement of teaching and learning. The survey confirms that feedback to students is often overlooked, and that there is a poor use of information in decision-making about quality improvement in the area of teaching and learning. When looking at the drivers for the development of quality management, both internal motivations and external push factors are important. The concern with the enhancement of the image of the higher education institution is a dominating internal motivation while the development of QM remains also strongly driven by the national quality assurance system. Among the internal factors that are seen as supportive of the development of QM, leadership support emerges clearly as a main element, together with participation of staff in the development of QM procedures.